Frugal & Fabulous: Review: New Nature Valley Products! Review: New Nature Valley Products! I recently had the opportunity to try some of Nature Valley's newest products and they are gooood! 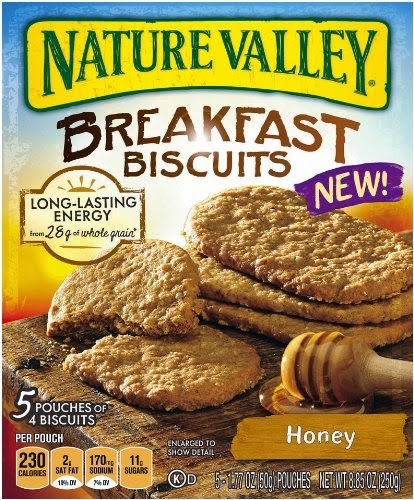 I loved all of these products - but my favorite was Nature Valley's Honey Breakfast biscuits. I go into work early and usually I don't have a lot of time in the morning. But breakfast biscuits are easy to throw in my bag and eat on the go, or easily eat at my desk. These biscuits are tasty, light and crispy bars. They are lightly sweet and very satisfying! And with 28 whole grains, they kept me full until lunch! 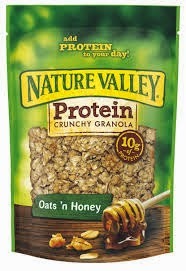 Nature Valley Protein Granola is another great option. It's great to eat on its own as a snack, or mixed into yogurt! We have been big into trail mix lately, so we'll even mix some of it right our snack bags. This granola has 10g of protein so it's a smart snack that will tide you over! It's crunchy and satisfying! 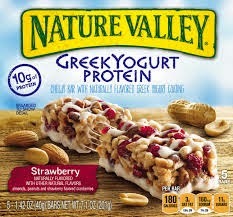 And for a great anytime snack, check out Nature Valley Greek Yogurt Protein bars. If you love the smooth and creamy taste of Greek Yogurt, you'll love these bars. they are sweet and savory. They have a layer of yogurt, mixed with almonds, peanuts and strawberry flavored cranberries. Wholesome, delicious and protein packed as well! Next time you're at the store, check out these great new products! And check your coupon inserts for money saving offers! Disclosure: I received a product in exchange for this post. All opinions are my own.